This historic tour focuses on the Ripy family of Lawrenceburg, KY. This tour begins with the young Irishmen, James and John Ripy, who left their home in Tyrone, Ireland for the cliffs of the Kentucky River. You'll follow the growth of the family from James’ initial foray into distilling to the Ripy Brother’s Distillery which is the current Wild Turkey Distillery. This tour includes visiting the uniquely beautiful Ripy Mansion in Lawrenceburg that will be conducted by a Ripy descendent, a stroll down Lawrenceburg’s “whiskey row” to learn of other prominent distillers of the era, and a tour and tasting at Wild Turkey Distillery. 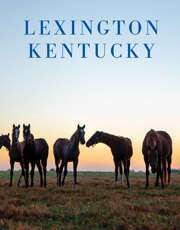 Pickup is at the Lexington Visitors Center for the drive to Lawrenceburg, KY. The tour is approximately 4-5 hours. Water and snacks are provided. Price includes tour of Ripy Mansion, tour and tasting at Wild Turkey.